Words are taken from Chapter 5 “Let Girls Play, Too” of Meet Julie by Megan McDonald. “Dakota” is standing in for Julie’s best friend, Ivy. “Saturday morning Julie was reading her horoscope — “Don’t hesitate; today’s the day to jump in” — when she heard Ivy’s knock. “You’re here!” Julie said, leading her friend into the living room. The two girls pushed boxes into the corner so that Ivy could show Julie her latest floor routine. “Did you know Olga Korbut was the first person to do a backwards aerial somersault on the balance beam?” Ivy asked as she turned her handstand into a back limber. 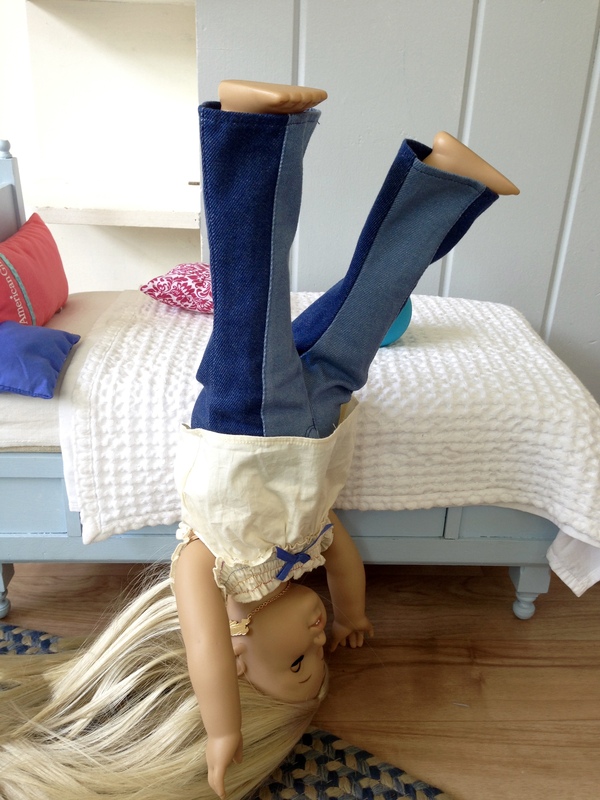 Julie tried to copy the move, but as soon as she got into a handstand, her feet clomped to the floor. Olga Korbut was a former Soviet gymnast who won 4 Olympic gold medals and 2 silver medals. Today she is 61 years old and a US citizen living in Scottsdale, AZ. I don’t think Olga would approve of Ivy doing handstands in Dr. Scholl’s sandals! This entry was posted in Dakota, Historical Fiction, Julie and tagged American Girl, Rio Olympics on August 12, 2016 by Jen. I like Julie’s shirt that she’s wearing because I want one for my doll too! That’s great Julie could do it with just the bed to lean against. I’d need an entire wall, even then I don’t think I could do it. Ivy’s dress is super cute. Thanks… My mom aka Grandma made the dress which was originally a sleeveless shirt for a Corelle baby doll. It’s a rainy day here and I’m reading Rebecca’s books for the first time. Cool! Please tell me what you think of them. I really liked them. I’m into book three, and really enjoying them. I grew up in and still live in a community with a large Jewish influence, and as a kid would have dinner with my friend’s family on Friday when they lit their candles. Now Brianna has had this experience too. I’d love to have some of Rebecca’s original things, like the challah and her lunch basket. Not too impressed with Rebecca’s outfits as of late. I remember watching Olga Korbut, she definitely inspired a lot of girls my age to get into gymnastics. Hard to believe that the moves she did back then are considered easy in comparison to what they do now! Absolutely! DH showed me the gold medal winning gymnast from some time in the 50s, and she basically vaulted with a cartwheel over the top. Brianna wanted to watch “Ace of Cakes” instead of gymnastics! Sorry, you have to sit with mom and watch team USA!